Memory maker OCZ has confirmed it will launch a new 1TB Solid State Drive (SSD) that will fit 3.5-inch drive slots later this month. Various gadget sites have been reporting on the rumors of the launch, and now the company confirmed that the 1TB Colossus SSD drive will be available in mid-August. Also confirmed: the drive will cost a whopping $2200. 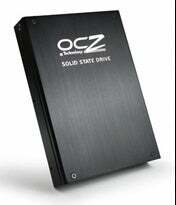 Unveiled last month at the Computex expo in Taipei, OCZ's 1TB Colossus SSD drive is indeed colossal. The drive weighs 14 ounces, but is compact enough to fit into a standard 3.5-inch drive bay. Laptop users will have to wait for a smaller version, though. OCZ's Colossus drive doesn't come cheap either. With a $2200 price tag attached, the 1TB SSD drive claims read speeds of up to 250MB/s and write speeds of 220MB/s over a SATA2 interface. But if you don't want to re-mortgage your house for the 1TB Colossus drive, OCZ will also launch less pricey, lower capacity models. For $300, you'll be able to get a 120GB version, $650 will get you a 250GB model, and $1200 will get the 500GB model, the company says. OCZ also launched in April a similar 1TB SSD drive offering, but in a smaller form factor (with better writing speeds) and a bigger price of $3000. SSD drives can deliver faster data access and lower power consumption over traditional Hard Disk Drives (HDD) But like in this case, the price for such a drive can be prohibitive for many users. So until SSDs will retail for a much lower price, don't expect the death of the HDD just yet.